The final matchday of the Champions League group stage saw one of the tightest groups reaching its conclusion. Liverpool hosted Napoli at Anfield in group C, with PSG facing off against Red Star Belgrade, it was highly anticipated that Les Parisiens would come out as the victors. Hence, the scenario at Anfield was clear. 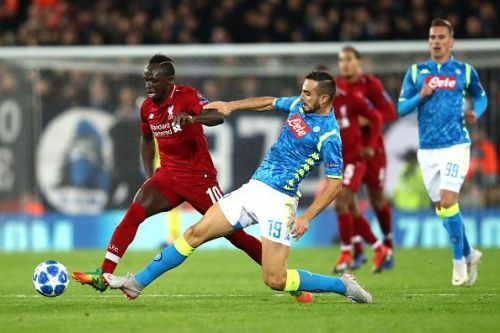 If Napoli doesn't score, Liverpool had to win the game by a goal, and if they do score, Liverpool had to win the game by two clear-cut goals to qualify, else the team from Naples qualifies. Despite the scoreline, the game was a high-paced, end to end affair. Mo Salah's 34th-minute strike gave Liverpool the lead, which they managed to hold on to till the very end. With PSG comfortably winning in Serbia, the win at Anfield secured qualification for The Reds, while Napoli has dropped down to the Europa League. So lets take a look at the performance of each Liverpool player and rate them. It was a dodgy start for the Brazilian, with him misplacing few of his early kicks. However, when called upon, Alisson was ever present with his safe pair of hands. He made an exceptional save in the dying moments of the game, fending off Arkadiusz Milik and effectively pushing Liverpool into the next round. The young Englishman was full of energy, running raucous on the right flank. He moved forward at every possible instance, but left huge gaps behind, enabling Insigne to make the most of it. Matip was a surprise inclusion when Klopp named his starting XI, as Dejan Lovren was the expected centre back. However, the Cameroonian defender did not disappoint as he put up a solid performance despite missing minutes this season. An early booking meant the Dutch defender had to be extra cautious throughout the game. Despite that, what he delivered was a match-winning performance. Defensively sound, he also occasionally contributed in attacks whenever his team needed him. Industrious as ever, as he kept making forward runs. The Scottish international had a few scary moments in defence, and his delivery wasn't at its usual best. But he grew into the game as it progressed, making few crucial blocks and serving an assist to Mane on a plate, but the Senegalese failed to convert. Another player who grew into the game as it progressed. The first half saw Napoli easily bypassing the Dutchman. Later events saw him holding possession well and linking the defence to attack smoothly. Henderson's game can be described in patches, good ones and bad ones. The bad ones included him giving away the ball easily against Napoli's press. The good ones were his ability to shield the ball, and covering the pitch tirelessly. The most influential player in the midfield three. Right from the start, his link-up play with the front three became a problem for the Italians. He had an opportunity to score in the second half but flashed the ball just wide of the goal. The Egyptian certainly put up a match-winning performance. He looked like a threat throughout the game as the Napoli defence had no answer to his blistering pace and sharp wit. He scored the only goal of the game, putting the ball past Ospina, manipulating the Colombian goalkeeper to dive in the other direction as he anticipated a cross. The Brazilian was back in his preferred central role. Firminho isn't your normal goal-scoring forward, but serves up more like a false 9, creating spaces for Salah and Mane to exploit, which he did fairly well. However, he's still struggling to find the form he was in last season. With the number of chances gifted to him in the game, you do expect a player of his calibre to convert at least a couple of them, but Mane failed to do so on each occasion. He occasionally got himself into good positions using his pace, but fumbled every opportunity presented to him, including a one on one against Ospina. He was brought on in the 78th minute to provide defensive stability to the team, and that he did provide. Brought on in the 84th minute. Brought on in the 89th minute.